Surprise, surprise – we have another Michigander visiting this weekend! As part of our Denver tour, we like to bring visitors to Tommyknocker Brewery on Miner St in Idaho Springs for some fantastic food, and incredible beer. 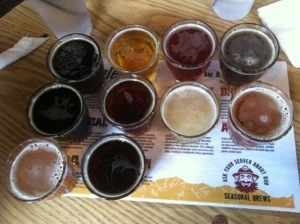 Try the whole flight for $1.50 per 5 oz sample, like we did pictured above. Stay tuned for our write up on Tommyknocker’s. I made it to Wynkoop and Strange, but missed this one….dam.